Moira Gallagher have a number of Syrian families who now attend the kindergarten. 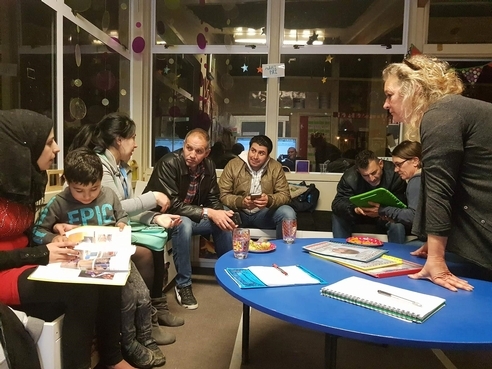 The teachers realised, due to language barriers, they weren’t able to have in-depth conversations with the parents around their children’s learning. 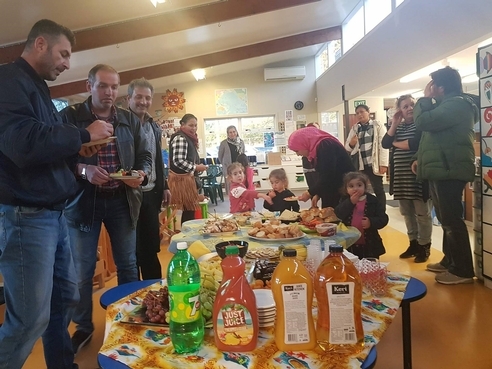 Last week the teachers held their first hui at kindergarten for the Syrian families. They contacted the Red Cross and sought the help of two translators. Initially they wrote a newsletter to the parents and got this translated, inviting them to the kindergarten for a night of discussing their child’s learning. teachers were able to talk with parents about some medical practices that might support their children – that differs a lot from what the practices are in Syria. The teachers from Moira Gallagher were also aware there were a number of Syrian families who had children enrolled at Nuanua kindergarten. These families and teachers from Nuanua were invited to attend the hui. They joined the evening and found it very valuable. This has strengthened connections for the families between the two kindergarten settings. Teachers, parents, children and translators talking together. Sharing kai during the hui.